Non-hydro machine serial # 47xxx. 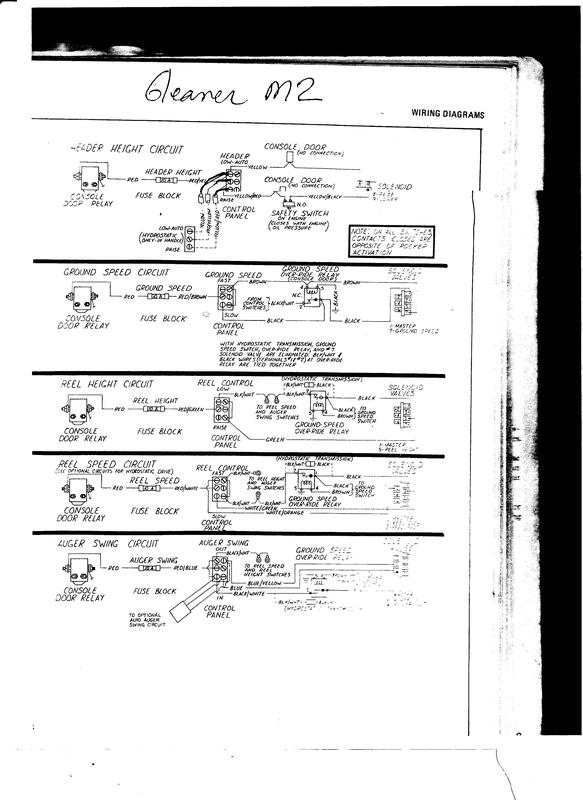 Agco Partsbook shows a later dash configuration that has switch handle and harness for a hydro machine and a harness for the non hydro. Could a combine come thru with all the hydraulics and controls and no momentary switch. I'm going to look this morning if there is a plug in the header height control wiring for that. There is a picture on the dash of what I think is header height control between the reel raise/lower and header clutch switches, but no cutout for the switch. Last edited by Angus4u0; 11-23-2018 at 08:13 AM. I'm not at all familiar with the F2 combine---It looks quite different than the L/M systems. I'm pretty familiar with the 3 position spring system, but I have no idea how it could have been applied on a F2. You say you can make it move by moving the contact springs against the sensors...well, yes, that is how it works. The float motion of the cutterbar moves the contact bars against the springs, sending a raise and lower signal back to the controller in the dash. It was supposed to be enabled by tapping the down switch on the hydro handle--which you don't have.... The thing is, if doing that makes the header move, then its working. You just need to figure out how it turns on/off for manual control. Its's possible that your machine was updated to the 3 position, but without the hydro handle raise/lower rocker, IDK how you would enable/disable auto. I'm attaching a schematic of the 3 position system from a R62 combine...IDK if it will help you or not. Note you need power from the header clutch, and that the Raise lower switch is what turns the controller on/off. 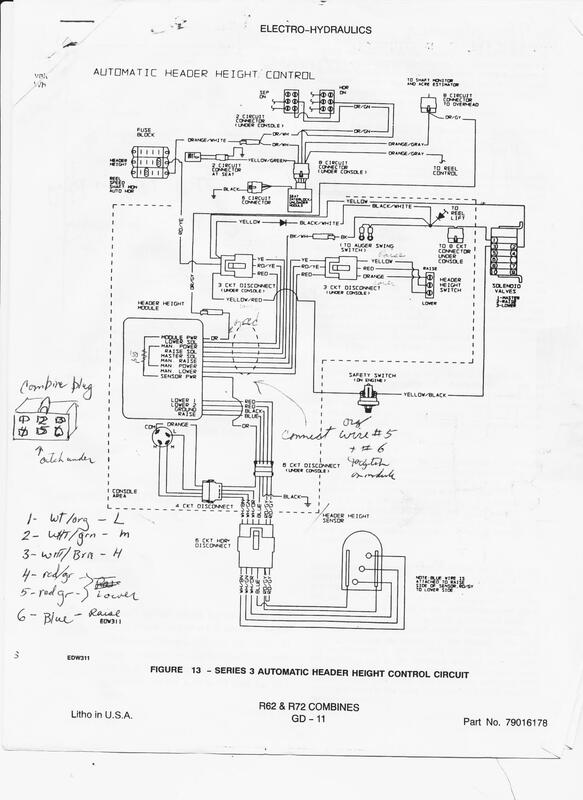 I'm also attaching the M2 schematics for the original 1 position microswitch system. NO idea if they will help. 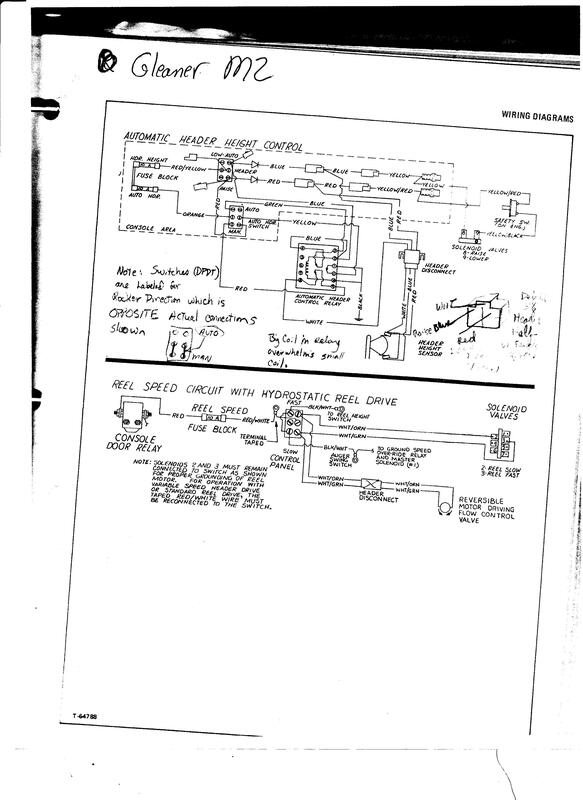 Didn't the F2 use the "Genie" mechanical system with a cable activated valve up on the side of the cab? After reviewing all the information, the first thumbnail appears familiar. My plan of attack is to pull the control module and trace the wires, now that I know the colors, to where the switch should be. Thanks for printing that out. I'll give you an update of what I find. 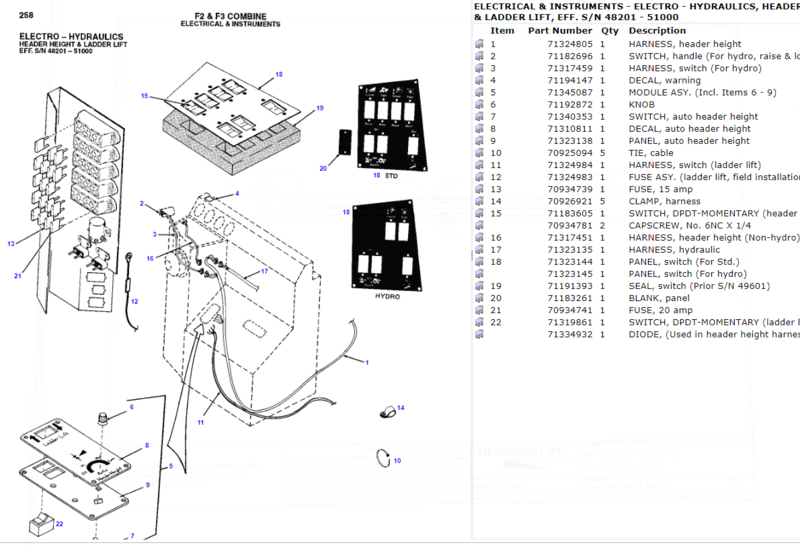 FInally found what I believe is the applicable parts page. Your combine is earlier than the s/n break, so it had to be added later. I'm pretty sure what you are looking for is Item 15 on the attached clip. That would be the switch replacing the Hydro switch. Just a thought---does your combine have a switch in the ladder lift spot (#22)...w/o ladder lift? That's what I would have done if I was installing that system aftermarket. No switch in the ladder lift spot. There is a black plastic relay mounted on the bottom of the fuse door. I know that works because it clicks when you turn on the three position switch. I know I have to do a little more tracing, but the wiring appears to be correct up to the 3 circuit disconnect before the elusive header height switch. There is only two wires coming out of that disconnect, and they don't go to a switch. They are heading somewhere else. Need to do a little more investigating, but it may be possible to jumper it right there to send power to the raise/lower circuit. Let me do a little more investigating.